State Sen. Carlos Uresti was convicted of 11 felonies, but that doesn't mean he immediately has to leave the state Legislature. And he'll still be eligible for his sizable government pension. It didn’t take long for the rebukes to start pouring in after state Sen. Carlos Uresti was convicted of 11 felonies Thursday. Colleagues on the left and right called on him to resign. But the San Antonio Democrat insisted after the verdict that he had no immediate plans to step down and pledged to appeal his convictions. A day later, the Republican Party of Texas asked in a press release, "Why has Carlos Uresti not resigned?" But Uresti has at least one big reason to stay in his seat: money. State legislators draw a puny salary — just $7,200 per year, with an additional per diem during legislative session. But their government pensions can grow as large as $140,000 per year. Uresti would still be able to draw his sizable government pension after he leaves office, despite his felony fraud and money laundering convictions. And with every month that he remains in the Senate, it just gets bigger. The Employees Retirement System of Texas can't confirm whether individual lawmakers elect to receive government pensions, but all state legislators are eligible — and it's an attractive package. The size of a government pension is determined by a legislator’s years served. Since Uresti has served nearly 21 years in the Legislature — combined with potential additions for his four years of active service as a U.S. Marine and other optional service credits — his pension could already be as large as $89,000 per year. Felons are ineligible to serve in the Texas Legislature, but Uresti can keep his seat while he appeals. If he serves until the end of his current term in January 2021 his pension could grow by more than $9,000. And that money won’t go away even if Uresti is finally convicted. A law passed last year renders certain felons ineligible to receive government pensions. But that law isn’t retroactive, meaning it doesn’t apply to crimes committed before June 2017, according to Mary Jane Wardlow, spokeswoman for the Employees Retirement System of Texas. 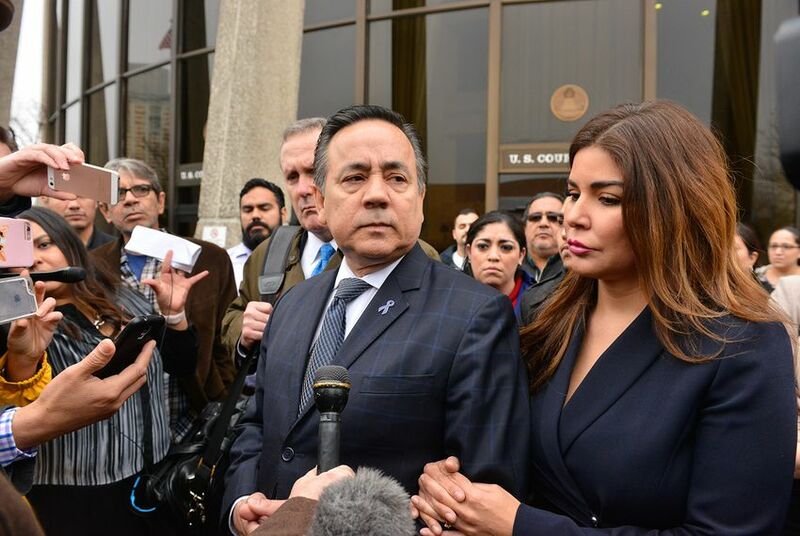 The 11 crimes Uresti was convicted of on Thursday — and the separate bribery charges he’ll go on trial for in May — took place before the law went into effect. Uresti isn’t up for re-election until 2020, but he’s already been relieved of some of his Senate duties. Lt. Gov. Dan Patrick, a Republican, announced yesterday that he’d remove Uresti from his Senate committees. And his Senate colleagues might have the option to remove him from the upper chamber before his term ends, though the procedures for such a step are murky and rarely used. The Republican Party of Texas and the Senate Democratic Caucus have both called on him to resign. The Texas Constitution allows each house of the Legislature to “expel a member” with a two-thirds vote. That provision also appears in the Texas Senate rules. But it seems that that hasn’t happened since 1927, according to Ana Martinez of the Legislative Reference Library. In that case, Francis Dale and H.H. Moore were tossed out of the House on bribery charges.